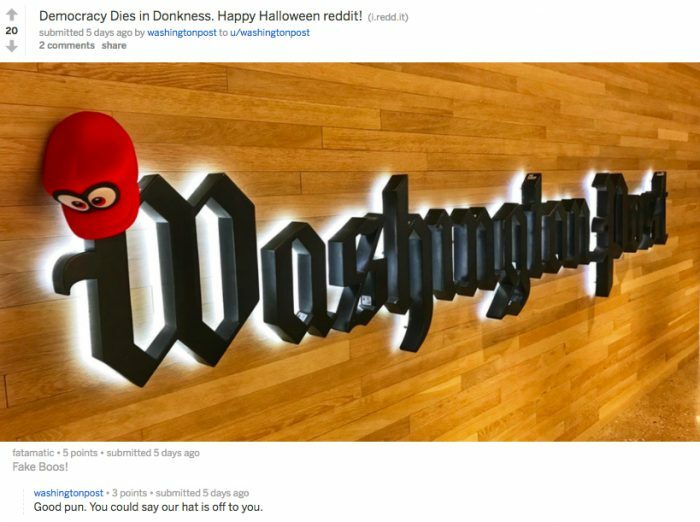 Nov. 8, 2017, 9:14 a.m.
By Shan Wang @shansquared Nov. 8, 2017, 9:14 a.m.
That’s not a typo in the Washington Post’s Reddit profile: The Washington Post account is an avid poster of some pretty good memes and gifs. It’s got jokes. 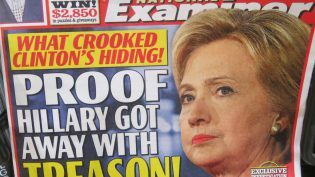 It’s also a sharer of everything from polling stories to breaking national security stories to lifestyle columns to geeky features to fact-checks, and a facilitator of, and participant in, AMAs. The official publisher account has been live since April of this year, shortly after the platform began allowing public profiles, and appears to have broken through Reddit’s tough anti-brand, anti-paywall shell. One does not simply walk into Reddit and start pushing one’s own stories; the community has always had a serious allergy to self-promotion. Journalists have for years plumbed it for news stories (and other entertaining content), a practice Redditors haven’t looked upon fondly. Reddit is also home to 1 million-plus (and growing) subreddits; matching Post stories with the niche communities that would be receptive to them is yet another hurdle. And while some of the darkest subreddits such as r/Nazis or r/DylannRoofInnocent have been banned, trolling and viciousness remain. The not-so-revolutionary secret to the Post brand’s gradual acceptance by Reddit is its consistent transparency, including responding to unflattering accusations about the “Amazon Washington Post” and its ownership, or questions about how John Podesta has influenced the Post’s reporting since “he was brought on board” (he’s a contributing columnist, not an employee). The Washington Post has a paywall but offers free-access deals through Amazon Prime (free for 6 months, then $3.99 a month for Prime members). Park, however, refrains from mentioning any of that himself, relying instead on other Redditors to offer subscription suggestions. Rollicking AMAs are Reddit’s bread and butter, and Park tries to get at least one going every week. David Fahrenthold has done one (user ‘PutinsMissingShirt‘: “Do you also feel that ‘nothing matters’ anymore?” Fahrenthold: “Great question. No”). Tokyo bureau chief Anna Fifield, who extensively covers North Korea, did one — it ended up being the Post’s most popular AMA, at 574 total comments. The Post’s Moscow Bureau did one, also topping 500 comments. But Park points out he’s also helped the Reddit community get access to AMAs with favorite figures totally unrelated to the Post. While they’re not primarily used as a driver of traffic, some of the Post’s Reddit efforts have resulted in new visitors. Working with the Tropical Weather subreddit during the Harvey-Irma week, the Post’s Capital Weather Gang offered updates in the live feed monitoring hurricane progress. There’s no money involved in the Reddit-Post relationship, both sides confirm. Reddit keeps the Post in the loop about new features it’s launching — such as the ability to post native video — and helps identify active subreddits that might be interested in Post stories, according to Park, especially since breaking out of politics can be a challenge. POSTED Nov. 8, 2017, 9:14 a.m.
Wang, Shan. "The Washington Post on Reddit surprises users with its non-promotional, ultra helpful presence." Nieman Journalism Lab. Nieman Foundation for Journalism at Harvard, 8 Nov. 2017. Web. 23 Apr. 2019. Wang, Shan. "The Washington Post on Reddit surprises users with its non-promotional, ultra helpful presence." Nieman Journalism Lab. Last modified November 8, 2017. Accessed April 23, 2019. https://www.niemanlab.org/2017/11/the-washington-post-on-reddit-surprises-users-with-its-non-promotional-ultra-helpful-presence/.